Expense reports, tax statements, invoices, insurance policies, claims, ordinary receipts: Life is full of boring bureaucracy. Most of us try to avoid spending any unnecessary time on paperwork, and I'm no different. That said, I've noticed that I am probably not really minimising my paperwork time, going about some matters in a sloppy, irrational way. Procrastination and bad habits lead to spending more time, not less -- fighting exceptions, asking for extensions, and most of all, searching for badly organised but vital information - be it on paper or in electronic form. So I decided to change things, for a more systematic approach. I'm my own all-in-one clerk, controller, CFO, and auditor. Perhaps writing about it will make a boring task more fun? Perhaps documenting my own processes will make me more organised? Compared to corporate finance and administration, I have many more degrees of freedom. Fewer legal requirements. No arbitrary corporate policies. More possibilities to make rational choices. And no boss to report to - which, in fact, can turn out to be more of an invitation to procrastinate, than a liberation from unnecessary duties. Starting at the bottom-most level, I need to decide on a workflow for paperwork, from incoming documents, processing them, and archiving them. Paperwork is in my case distributed over a multitude of inboxes: snail mail to two physical addresses, and email which in turn may be mere notifications of the need to log in to accounts behind passwords to banks, credit card companies and various other service providers (all in the name of "simplification"), followed by mandatory use of yet another, particularly badly structured de-facto inbox in the form of the Downloads directory. My belief is that I will find out the easiest process by looking at the desired end state: What documents do I want to archive? In which state, and where? At my personal level of geekiness, the following step for me is to decide on a directory structure for the inboxes, the work in progress, and the files on archive. As a Mac user still happy with many usability related defaults on Mac OS X, my starting point is the names created in my home directory by the operating system: Documents, Pictures, Movies, Music, as well as the transitional directories Downloads and Desktop. Sure, I could use "Documents" or a subdirectory of it, but much like Pictures, Movies and Music, I think financial documents deserve a top-level category of their own. They're usually PDFs (and if not, they can be made into PDFs). They may be quite sizable. Like Pictures and Movies, they can usually be allocated to a particular year. So, in the name of consistency, let it be Finances (or, in my case, Finanser in Swedish - as Finder on my Mac also displays Pictures, Movies and Music as Bilder, Filmer and Musik). lib for a Library of key pictures that remain valid over the years (profile pictures, logotypes, components of web pages and other visuals). Also, Pictures has photography related temp files used by applications, such as Lightroom and Photo Booth. Another difference between Pictures and Finances is that my photographic past is already sorted by year (and album). My financial past isn't, and I have to come up with a way to keep the two external HDs in sync while I'm sorting past finances. Likely, the total volume of files will remain small enough for me to be able to copy the entire Finances directory on my small 200 GB travel hard disk. Re-reading and iterating my thoughts, I believe that the directory structure I've thought out enables a smooth work process. Now, I have motivated myself to start enforcing the Finances structure. On my internal hard disk, it should be a matter of an hour or two. Checking which files are on the external hard disk only may take a bit longer - but just like with emptying the inbox, I need something to get started. 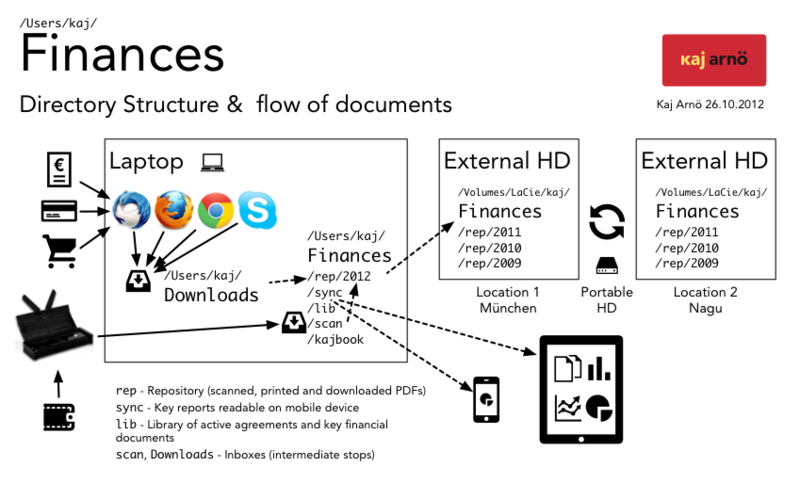 And having a proper structure for financial documents on the internal hard disk already goes a long way towards orderly finances.